Phillip Graham was ranked in the top 20 as Northern California junior. He took his playing skills to the next level where he was the #1 singles and doubles player for Foothill College in Los Altos,Ca . He achieved a ranking of #7 in all of the junior colleges in California. Phillip took his love for the game and decided to teach his knowledge to the next generation. He is now a full time coach and wants to help his students have that same passion for the game. 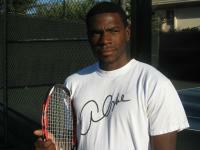 Phillip is currently active in the USTA Men’s Open Circuit and is rated as a 5.0 NTRP player. His interests are exotic cars and playing tennis.